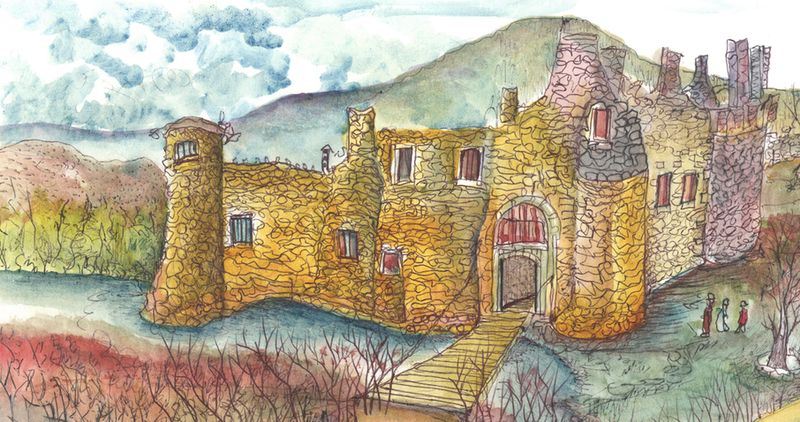 This wonderful watecolor illustration was done by Darryl Abraham of Naples, NY. Barefoot Princess is a witty, fast-paced fantasy for girls who yearn for adventure long before they yearn for romance. ﻿Twelve-year-old Amira is a rock climbing princess who loves the outdoors and hates shoes—almost as much as she hates having to behave properly. When her younger brother is allowed to go on a trip beyond the small kingdom—something she’d been waiting years to do—Amira attempts to stowaway. She wants to meet interesting people, ones who are different (like her). But while climbing the castle walls to sneak out, she falls into the river, plunges over a waterfall, and gets washed into the forbidden world Downriver. Shrunk to several inches tall, Amira teams up with a newt who has to leave the water because he lost his gills, and a rock-n-roll fairy who is an outcast by choice. Neither believe that muddy, muscled Amira is a princess, but they will help her look like one in hopes she can command the invading giant trampling innocent creatures to leave. Amira, is surprised to find that what she wants most of all is to return home. Now she must use everything she learned from the dreaded diplomacy lessons or else she’ll be gone in one bite before the giant can set her on top of the cliff so she can begin the long walk upriver. As the three put their plan into action, Amira tries to figure out how to save Downriver, return to normal size, and be with her family without losing her first real friends. Her biggest fear is that the giant won’t believe she’s a princess either because, heck, what does she know about what makes a princess a princess? She’s spent her entire life trying not to be one! This is my first novel for children, a middle grade novel aimed at ages 8-12. I will update this page so you'll know where I am on the hunt for an agent. *This project was on hold while I finished my nonfiction manuscript for Texas A&M Press on being a woman outdoors in America. I'm excited to return my attention to it. If you'd like to be notified when it is published, fill out the form below.